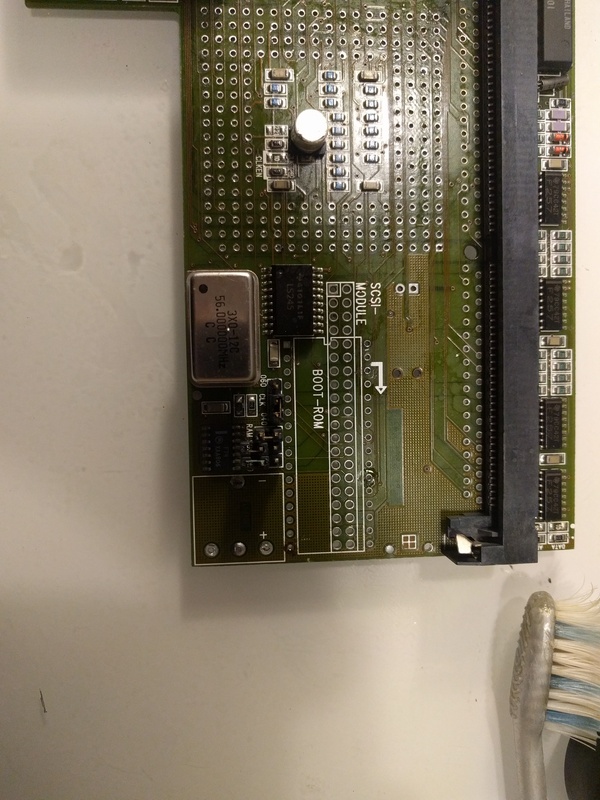 Well next card in the series how to upgrade different 68040 cards to 68060, it is time for the Apollo 1240. First, As Jens schönfeld ( Individual Computers ) owns the rights of the Apollo cards, I asked him for permissions especially when this requires a ROM change. he told me that I was allowed however only if I publish a diff..
if you know how I feel about Apollos, you should also know that I do not encourage people to keep using them. They are instable by design – it’s inherent in the logic equations, and there is no way to improve the designs. 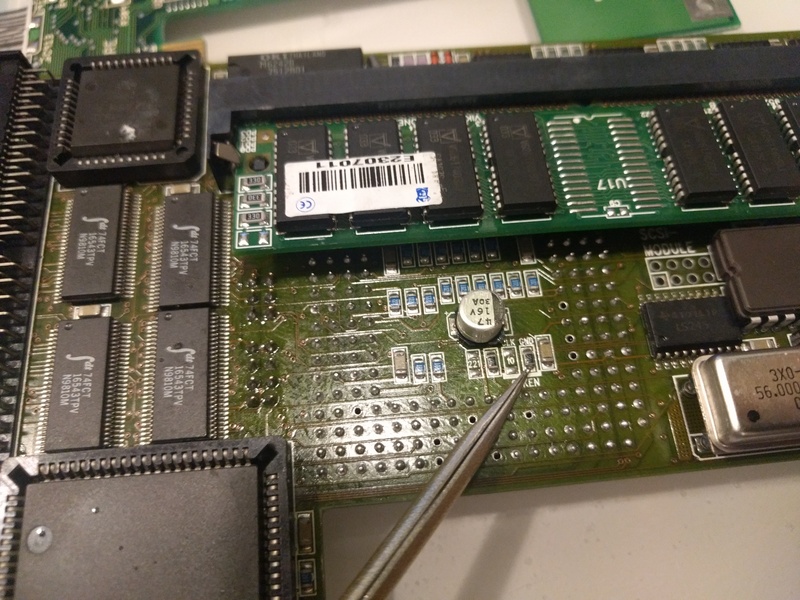 They work to a certain degree (note that I specifically avoid the term “reliable”) if you have the right memory modules, but you can never get them to work totally reliable – no matter what speed and no matter what CPU. Anyway, many thinks it still works and well it does run.. 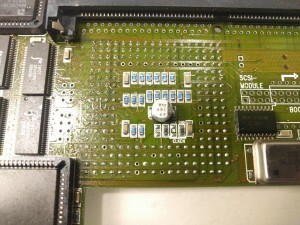 There is also a myth that the MACH chip must be of the 131 Version. This seems not to be true, as I have upgraded 2 boards with the 130 version without problem. So it is time to remove the CPU. this is not a easy task, without the correct tools, you WILL brick your card. and the apollo have very small mountingholes so desoldering is harder than on the Blizzard. 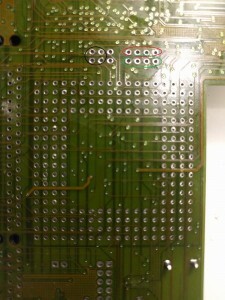 So remove the cpu, and also remove the solder in the nonused inner “line” as the 060 have more pins than the 040. You can see on this picture thee small circles. they are important. you must also remove the small jumperwires solderd there. Those circles are important later. as the 68060 uses 3.3V instead of 5V as the 040 uses. the Red circle is where you have +5Vm the Green circle is where the CPU gets its power from. (and you just removed the jumperwires routing 5V to it. so basically now the CPU will get no power atall. And the black circle is just ground. 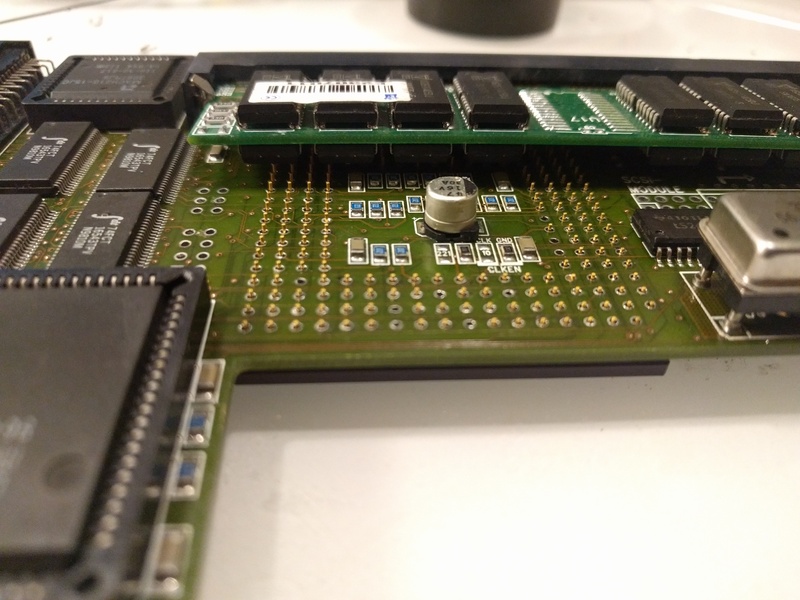 Remember NEVER to run a 060 cpu with 5V power. Now it is time to remove the ROM Aswell, as you will need to update it. I usually put in a doublesided simm into the socket while doing this, by doing that I know that it will fit later with the cpu soldered into place. 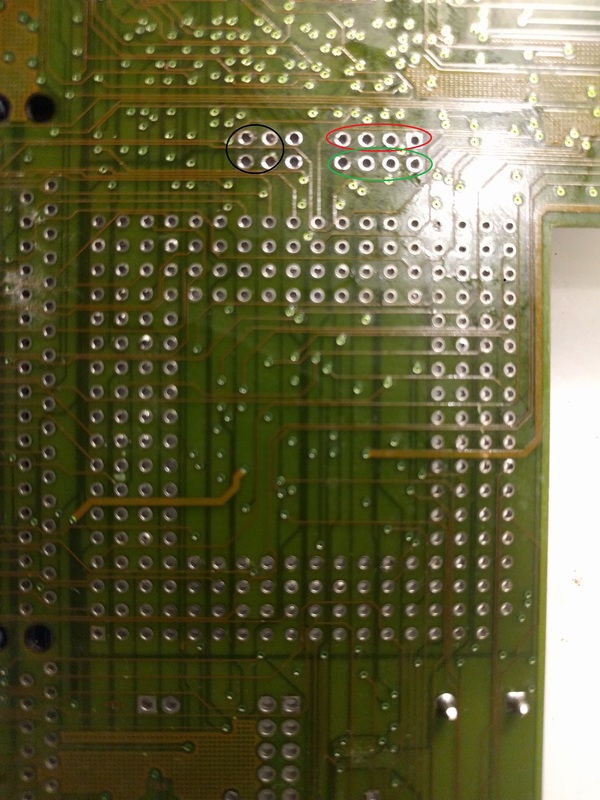 Here you can see that I have a doublesided socket in place, and the cpu where it is supposed to be soldered in. Now time to solder the CPU in place. CPU is in place. Now it is time to get that voltagething done. AND on the Apollo this is way more “tricky” than on the Blizzard cards as you actually need to use a board for voltageregulation. 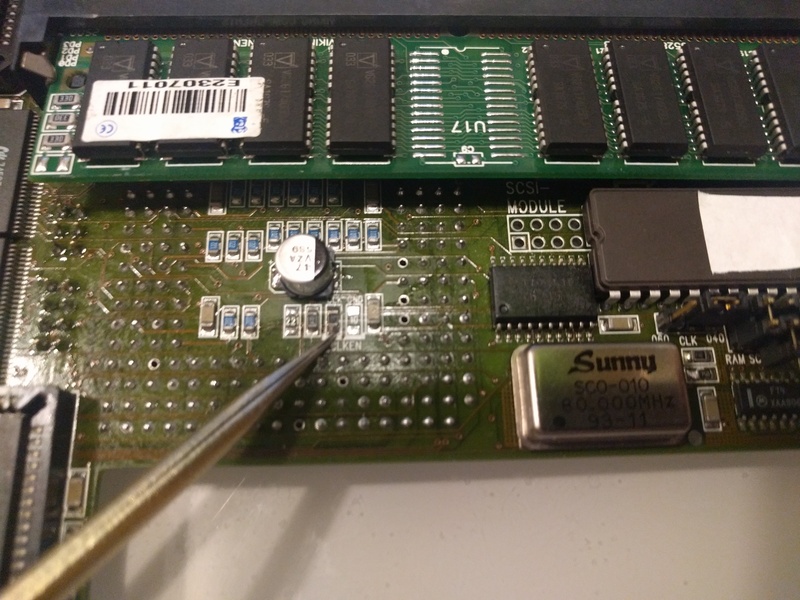 Burn the new ROM into a 27C010-10 Prom and solder it into the board. (there is usually NO space for a socket) you will need to clean up the 4 extra hols for the prom as this is bigger. Now you also need to move the CLK jumper to the right to the 060 position, and put the 060 jumper in place. So instead of 28MHz 68040, this is now 56MHz 060. 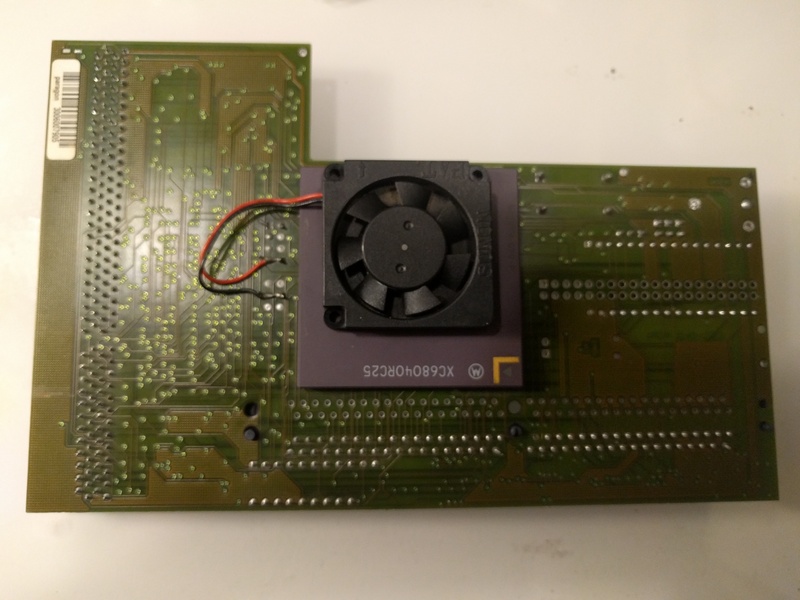 You CAN add a extra simmsocket allowing you to get 64MB of RAM into the board. Here marked with Red circles. 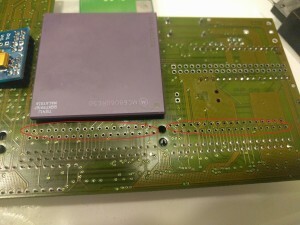 Remember that you will need to have the Rev6 CPU for this. 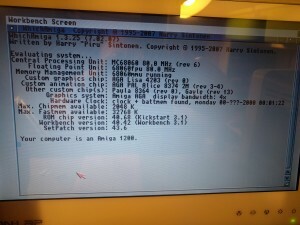 Doing this WILL lower the speed to the memory and is required or the machine will not boot at 80MHz. You can also see that I changed the capacitor on the board, I would recomend you doing this even without the overclock as they can leak. 80MHz! but active cooling is HIGHLY recomended when doing this. also I would recomend you to try to cool the regulator aswell. « Recapping, doing it right. Complete GUIDE How to do it. This is a very great description. Thanks for that, unfortunately I’m not so gifted to upgrade my Apollo 1240. Do you offer a conversion? My CPU is socked. But I certainly need a new Rom and the voltage converter. Hi, I followed your conversion tutorial from Apollo 1240 to 1260. It worked fine, but now I’m in trouble, I can not get it to work properly. I already tried with WBLite, ClassicWB3.5, AmigaSYS4 and with WB3.1. but they all show in “SysInfo” that a CPU 68040 is called but in reality it has a 68060 CPU. But my worst problem is not that, I am not able to load any system without giving initialization error or playing some game. 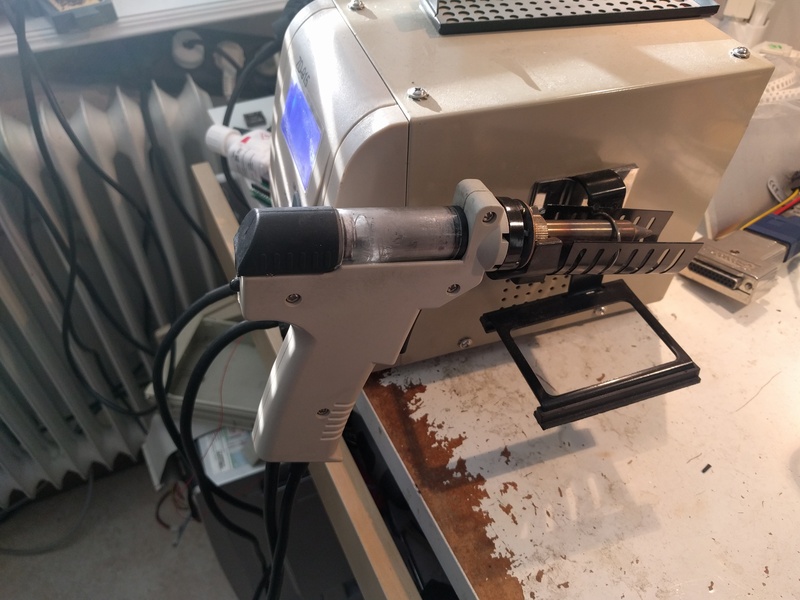 The only one that loaded very fast and with no problems at startup was Workbench 3.1 but this one without any modification beyond those indicated in the site I mentioned. But I only managed to open two games and without saying that it is very “naked”. But still everyone shows being a CPU68040. Could you please help me, please I really want to make this Apollo 1260 work properly. Please. May programs does show a 060 as a 060. you need an updated sysinfo for it to show correct. or you use whichamiga. So basically this is a bug in the software you are using. or simply that they do not support the 040.
and the most common problem is that people just put in a 68060.library from the archive you pointed to. you must put in ALL files in libs: and write over the old 68040.library. as setpatch actually always loads 68040.library- and IT will load 68060.lib. so with the wrong 040.lib file. no 060.library will be loaded at all. 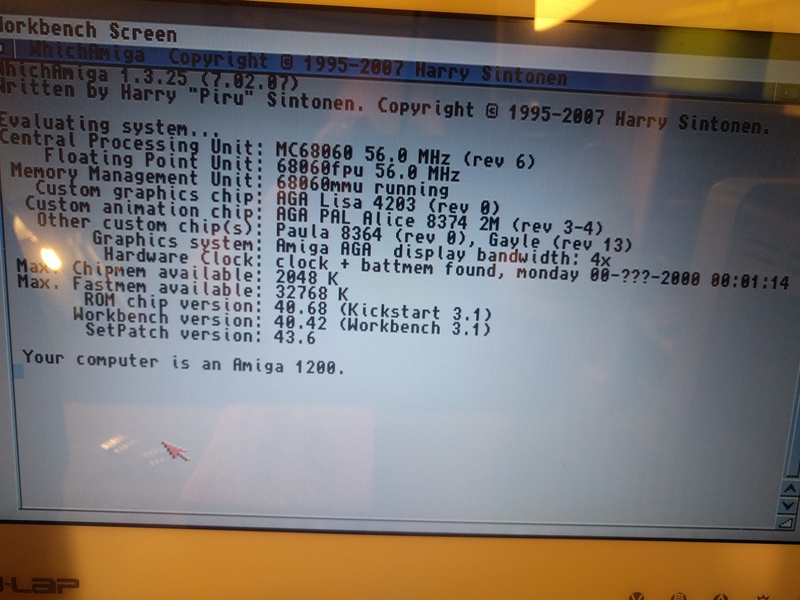 Its cool that someone proffessional still supports Amiga, geat! 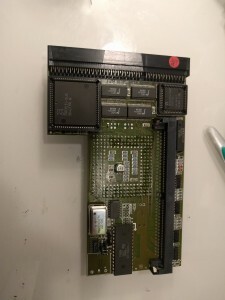 Many years ago, i was the first one to upgrade Apollo cards to 1260/80Mhz, i was quite active then and upgraded a lot of boards, both Apollo:s and Blizzard:s for A1200. 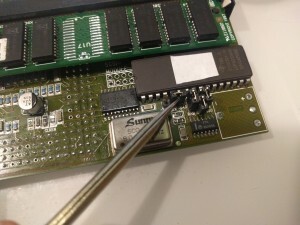 I would also say that the “myth” regarding the Mach130 chip upgrade to Mach131 originates from me. 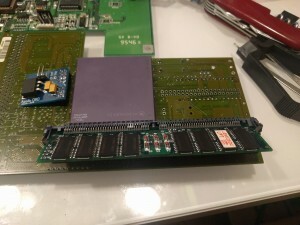 I do not know how you have succeded to upgrade cards without changing the Mach chip, i was never able to get these cards stable with 060 cpu and Mach130 chip. My guess is that the Mach chip is Cleitons problem. I have upgraded like 4 or 5 mach 130 to 80Mhz 060 without any issues.. actually never had any issue with a 130 one. 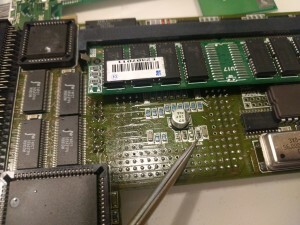 Since its been over 10 years since i last upgraded an Apollo card i will not argue with you, however i remember having all sorts of problems when trying to upgrade cards with Mach130 chip. Im happy to hear that you have been able to do the upgrades with success. Still, i would suggest that Cleilton tries with an original programmed Mach131 if possible. At the time i bought them from Jens Schönfeld until he refused to deliver, he doesnt want to know about any Apollo upgrades..:) I remember it was also important to upgrade the eprom to the correct (not LC) 1260 version. Thanks for the guidance but everything went well here. It was just a matter of configuration. I made this video showing how it works. 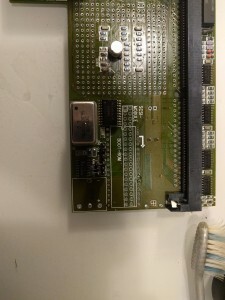 I have an amiga 1200 accelerator card from the ACT apollo 68040 (40 Mhz) with CHIP MACH 130. I would like upgrading to 68060. Please you can indicate to me how to do it. 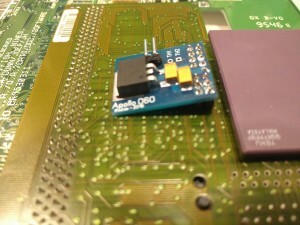 I already own a 3.3v voltage regulator. 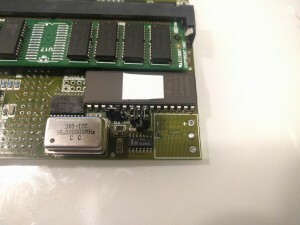 Eprom 68060, Chip mach 131. If you can do otherwise, please tell me where to send the card and how much it costs me. But my text clearly says that 130 is not needed… I however charge 170 for an upgrade. That would be 160 with your own regulator. I agree. please give me instructions on where to send the card, the voltage regulator, diode and how to make the payment. Since I am leaving for a long period of holidays, can we postpone the work at the beginning of September? 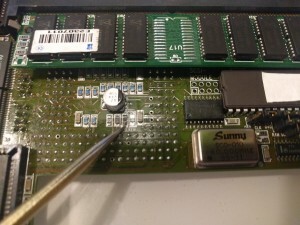 I´ve a stock 1240/25 card, where the accu has leaked und damaged the pcb around the F74. I´ve cleaned and sanded the pcd to get info where the pins are joined. I mad 2 photos to show. At the forum64 I´ve got the hint to contact you to get help? May it be possibel that you could have a look at the photos I made? can be helpful. I maybe will do a post about this part of the issue.. I have a upgraded Apollo with a problem. It works just fine with half of bus speed, but refuses to work with 1:1 bus speed. Seems that max bus speed is 40mhz and even 50mhz is too much. It refuses to boot if mem jumper is ON, even without memory modules, with anything faster than 40mhz. 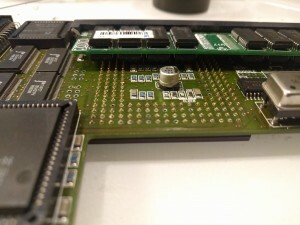 What other components could cause this, when jumper is ON and no memory modules are in place? Weird note is that it boots without memory modules, jumper ON with 60mhz, but not with 50mhz. oh thats weird.. so it boots with 1:1 but only if you run at 40? Current situation is that card works if remove resistor like Chucky guide says ( OVERCLOCKING TO 80MHz) and put jumper to 040 position. Fastest working 1:1 speed for CPU and memory is 40mhz. It doesn’t work even without memory module higher frequencies. So no memory problem. I don’t have rev 6 68060 cpus, so I would like to get it work with 66mhz CPU:Ram 1:1, or even 50mhz, but fastest working 1:1 speed is 40mhz.